Modern kitchen islands are exceptionally versatile and useful additions that make your life a lot easier. 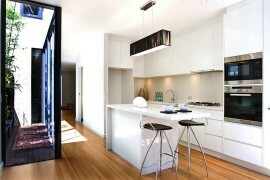 They are also incredibly popular and are on top of the kitchen renovation list of most homeowners. 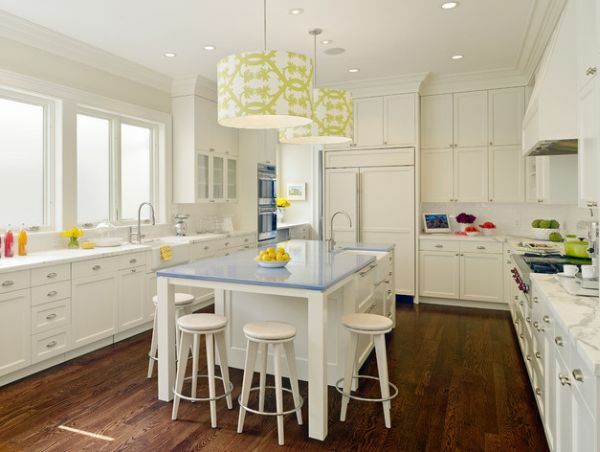 Yet, designing the perfect kitchen island takes both careful planning and proper execution. While getting it right can transform your time in the kitchen into an absolute dream, a poorly constructed kitchen island can create a whole new set of problems. 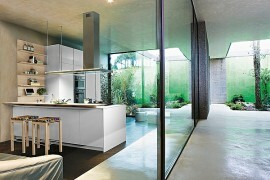 The idea is to combine form and function elegantly and to create a design that suits the specific needs of your home. Most homeowners seem to want a grand kitchen island regardless of the size of the kitchen and the available room at hand. 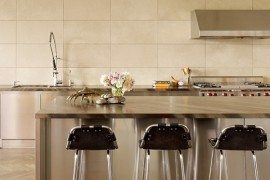 The most vital aspect of designing your own kitchen island is to first understand what works best for your kitchen. Look around and figure out exactly what your kitchen needs. Does your kitchen island need to double as a breakfast nook, or do you want additional storage space that helps tuck away the mess? Your kitchen island must complement and complete the kitchen. Not only will this give you the best result possible, it will streamline the choices you need to make. While you figure out what appliances and features are right for your kitchen island, it is also important that you work within the existing space constraints of your kitchen. Many tend to believe that lavishly large kitchens are blessed because of the available space they offer. While that is often true, huge kitchens also create some unique design challenges. An island that you choose must always be proportional to the size of your kitchen. If it is too big, then you will inevitably feel claustrophobic, and a diminutive island is both ungainly and a waste of precious space. Demarcate the space in your kitchen that you wish to utilize for the island and check out how close it is to the kitchen counters. Most homeowners tend to forget about leaving enough aisle space ,as they are too focused on the kitchen island itself. If you have a small kitchen, then experts suggest that a minimum of 36 inches is an absolute must, while 42 inches between the counters would be ideal. 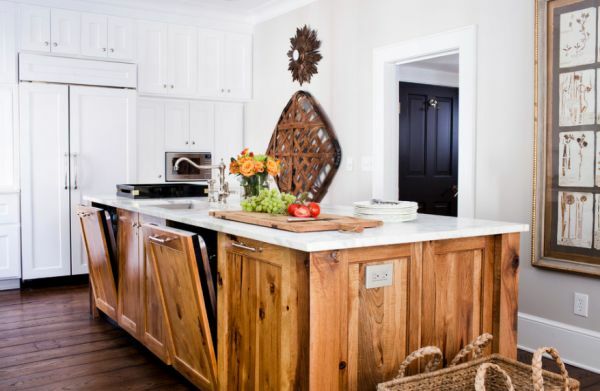 Having too much space between the counter and the island is not ideal either, as you would be wasting too much time and effort scurrying between the two! Remember all those times when you were told to think outside of the box in order to find a solution to your design conundrum? Now is another one of those moments. 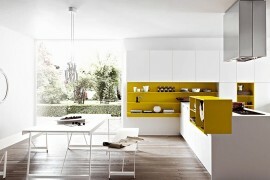 The image of a square kitchen island is so popular that many of us automatically gravitate towards this textbook idea. Yet there are plenty of other designs and styles available. An L-shaped or T-shaped addition, a lovely circular installation or a cool elliptical island inspired by the surfboard–the possibilities are simply endless. 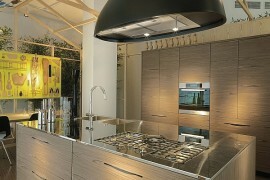 Let your kitchen dictate the shape and size of the island and do not fall prey to the stereotypical conventions. 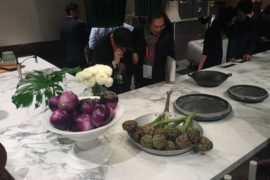 A countertop for the kitchen island should not just blend in with the style of the kitchen and its existing theme, it also must reflect your own cooking skills and culinary taste. 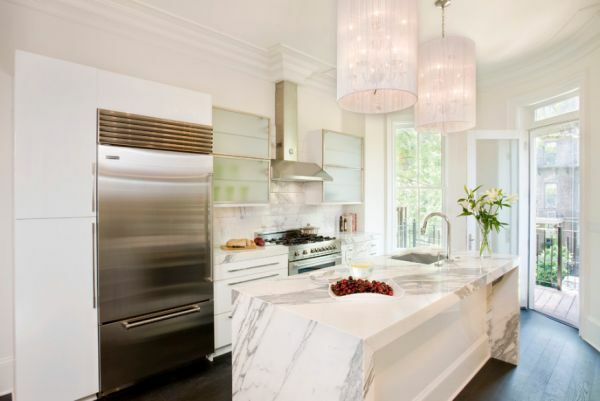 Add a butcher block if you are planning to utilize the island for food preparation, while a classy marble countertop is perfect if baking consumes most of your time at the island. 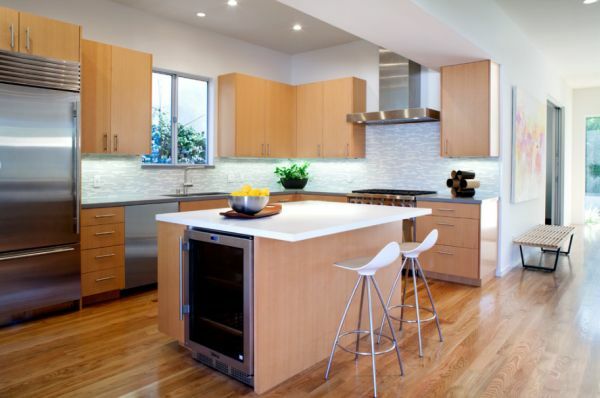 Stainless steel countertops are both sturdy and durable, and quartz is an equally popular choice in modern kitchens. 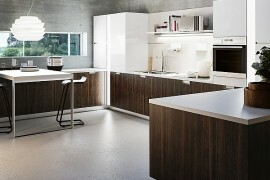 Storage units and smart cabinets are an essential part of the modern kitchen island. They allow you to tuck away the mess, organize your kitchen in a better fashion and make sure that everything you need is handy. If you desire a well-organized space, there are quite a few alluring options, and once again, the choice of shelving units and cabinets should be determined by the specific needs of your kitchen. Small kitchens with limited shelving will benefit from extra-deep drawers and large fold-away inserts that will provide you with ample storage. Larger kitchens are best served with islands that feature display cabinets and stylish shelves with glass doors. Since creating essential storage space is not a priority here, you can showcase your lovely china collection or the wonderful lineup of cookbooks you own! The kitchen is the heart of the house, and inevitably you find the family gathering around the kitchen island for a quick bite in the morning or a lovely meal at night. Plan in advance for the seating space that you will need to accommodate you at the island. 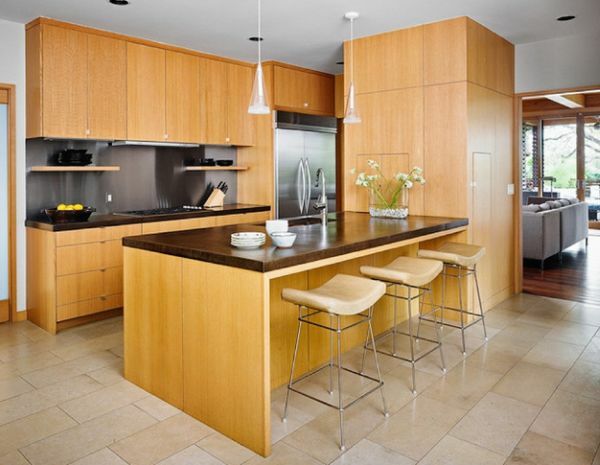 Many modern islands come with a design that places the countertop for food and drinks a tad higher than the one used for preparing and serving meals. 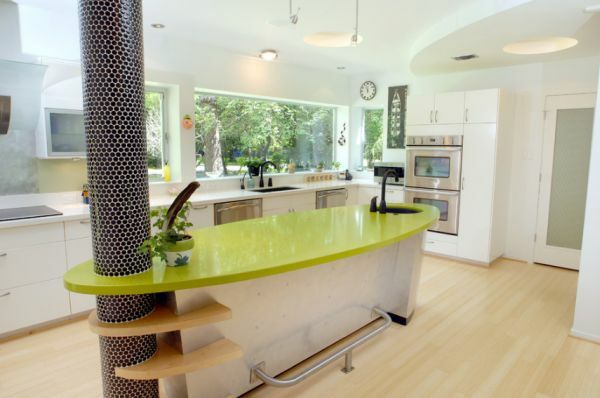 This also allows you to choose a wider range of kitchen bar stools or chairs. Also make sure you take into account the required knee clearance space for sitting comfortably at the island. Whether you intend to cook at the kitchen island or not is a choice that you need to make pretty early in the planning stage. If you plan on adding cooking amenities, you must take into account the additional costs and design constraints that come into play because of the plumbing and the additional gas line. 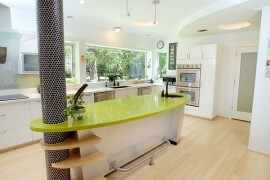 A kitchen island that doubles as a cooking station will also need a few smart appliances incorporated into its design. You might have to forgo a bit of shelf space for that oven, dishwasher and maybe even the small fridge, but it will be well worth the sacrifice. 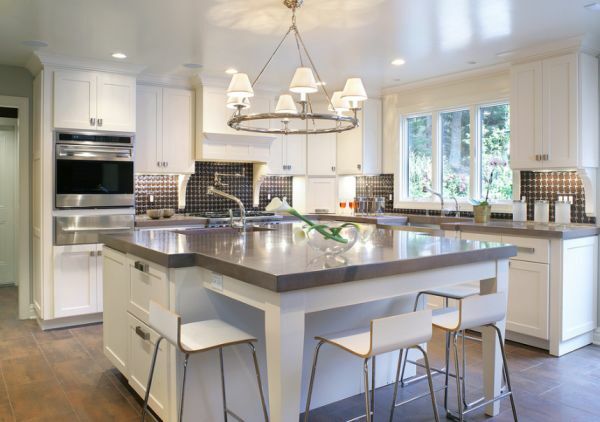 Lighting is obviously a key element of any kitchen, regardless of whether or not it features an island. 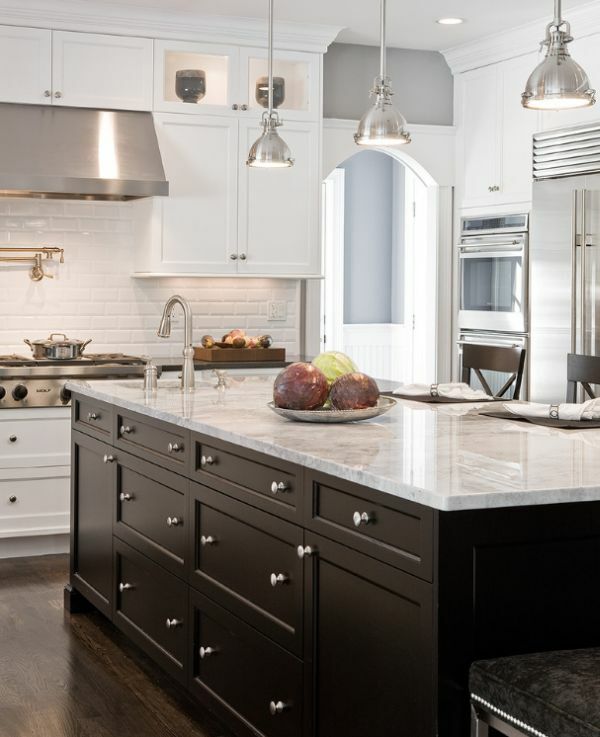 Pendant lights are generally the most preferred choice for kitchen islands, and if you need some additional help in choosing the right pendants for your kitchen, check out these stunning pendant light inspirations. You might also decide to add a layer of recessed lighting as well, making it possible for you to switch between focused functional lights and soft ambient lighting whenever required. 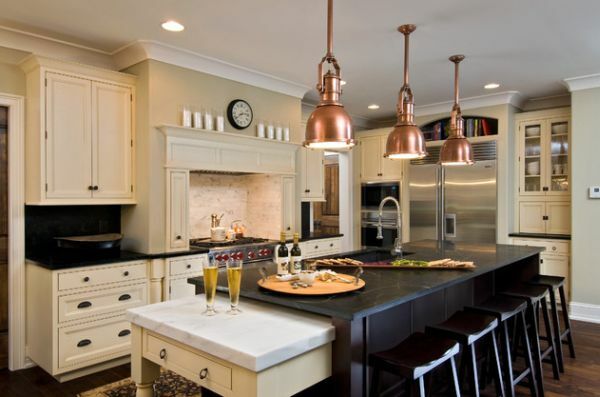 The rule of three is another perennial favorite that never seems to go out of style when it comes to kitchen lighting.